Environmental management is an integral part of Daniel K. Inouye International Airport operations. Equipment and procedures are established to maintain effective control in areas such as Noise Monitoring, Soil Remediation, Storm Water Controls, Spill Prevention, and Control and Counter Measures procedures. The airport complies fully with Federal Aviation Administration (FAA) and Environmental Protection Agency (EPA) requirements regarding runway safety areas, fire safety, perimeter security, storm drainage and other matters. HNL has an oil spill prevention plan that meets EPA requirements. On October 16, 2006, the FAA announced that the noise exposure maps for Daniel K. Inouye International Airport were in compliance with the Aviation Safety and Noise Abatement Act. HNL has had a successful bird hazard management program in effect since 1989 to reduce the presence of cattle egret from the open, grassy areas of the airfield where they feed on insects, mice and other small prey. The Reef Runway was the world’s first off-shore runway. The Reef Runway which was completed in 1977, was the world’s first major runway built entirely offshore. Great care was taken to minimize the environmental impact on surrounding areas, with the result that water quality was improved and provision made for the indigenous bird population of the region. The quality of water in the marine pond created by the runway was carefully considered by installing eleven 72-inch diameter culverts to allow for tidal circulation and mixing from the Manuwai Drainage Canal. 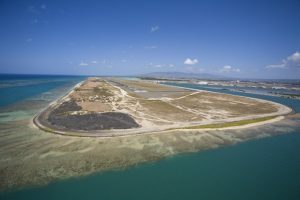 Other environmental protections included the construction of small islands in Keehi Lagoon for the Hawaiian Stilt, a rare and endangered species which could have been affected by the impact of the construction. In addition, two large bird sanctuaries designed for the Stilt’s nesting were constructed in nearby Pearl Harbor. They are still used by the Stilt. Although the Runway was planned before Congress passed the National Environmental Policy Act of 1969, the project was one of the first airport facilities having to file an Environmental Impact Statement (EIS). The EIS was completed and approved in 1972, but environmental groups obtained a temporary restraining order to stop the project. After going through three courts, and ending up on the doorstep of the U.S. Supreme Court, the runway EIS was ruled adequate, affirming the action of the lower court.